The most unbelievable stock in Singapore - Asiasons! Although it seems not to stop, I suggest be careful at $0.97-$1. I am aiming for this company to break $0.50, a major psychological resistance for this stock. 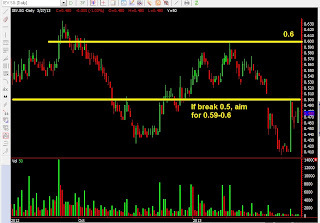 If broken, possible short term play, with a 1st target of $0.59-$0.60, 2nd target of $0.67-$0.70. If breaks $0.50, stop loss is set at $0.47. With the Cyprus incident over, it does seems like Singapore stocks is on a roll again. Penny stocks are again on the limelight. We Holdings again grapped the top volume with Magnus and Ntegrator also in top 10 list. These are the stocks that not long ago, dropped from the heights, that have fallen by 50% or more. These few days they are staging a comeback fiercely. The thing is will this run fizzled out. We shall see. To play these counters, we must be disciplined and have the time. Those without discipline and time are not advised to play with such volatile stocks. It is best you watch the good earnings stocks if you are working and cant monitor the screen. Stocks like Ezion, Guocoleisure and OSIM are what I label as good earnings stocks as they display results over the analysts expectations. These will be the stocks to watch this quarter. Eg. Magnus - $0.075 and $0.10 are major resistances. By the way, as a guideline, whenever such stocks burst forward, likelihood is that within 6 days, the run will fizzle out. So be careful not to go in on the 5th or 6th day. 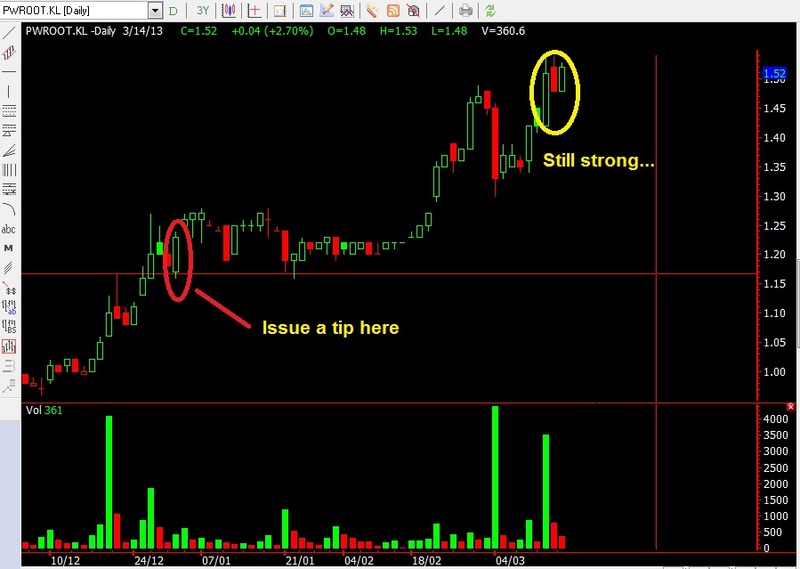 Wait for the consolidation... Set your stop loss below the consolidation support if you enter in the consolidation phase like what we always advised. And once you are in profit, constantly shift up your stop loss to guard your profits. SYDNEY (MarketWatch) -- Eurogroup officials announced a deal to provide Cyprus with 10 billion euros ($13 billion) in aid, in exchange for a series of measures which include the closure of a major bank and a levy on some large deposits. Top officials from the Eurogroup -- which represent the finance ministers of the 17 euro-zone nations -- briefed the news media on the deal shortly after midnight Monday morning, beating a deadline that would have shut down European Central Bank support and likely resulted in Cyprus leaving the currency bloc. Eurogroup chief Jeroen Dijsselbloem said deposits of less than €100,000 would be protected, but added that there was no way to save the country's second-largest lender, Popular Bank of Cyprus or "Laiki Bank." Now Dow is just 100 points down at noon time. If it closes today like this now, it will be DOW first triple digit decline for near to a month. In fact, I have been looking forward to a decline of some degree this or next month. So far, this month has proven to be a glorious month for the DOW because of the good economical reports released at the beginning of the month. In fact, I am very clean with no positions in the stock market now. Somehow I feel uneasy going into the US or local market purchasing stocks as I know the risk is still there. I am just putting my funds into commodities now as I do not want a stock market reversal to hurt my positions. This market sure needs a rest, and I probably urge you to take profit on your short term bullish positions. 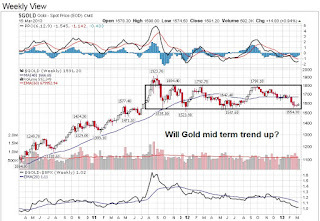 Gold price has been hanging above $1500 for the past 4 weeks. It seems that it has found a mid term support at $1500. Let us see if mid term, it starts to trend upwards from now. 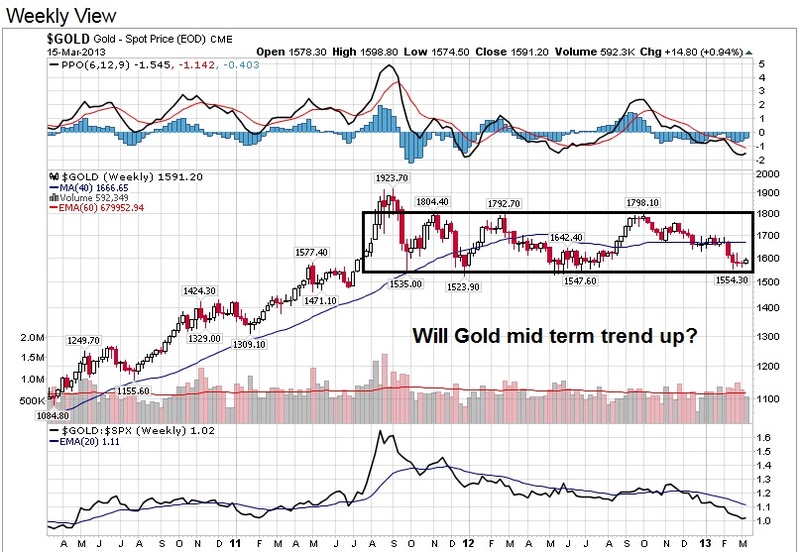 It has been traveling a BOX pattern between $1500 and $1800 for the past 1.5 years. Trend is still intact! Malaysia Investment Seminar: How do you locate the Next PWROOT??? KLCI has been fluctuating between 1600 and 1650 points. What is the direction now? Are there some stocks that have done well recently in KLSE??? Stocks like PWROOT has done well recently despite the 100 points drop in KLCI. How do you really locate such a stock? Do you study its fundamental or technical? Are there any indications that this stock has BIG players inside? 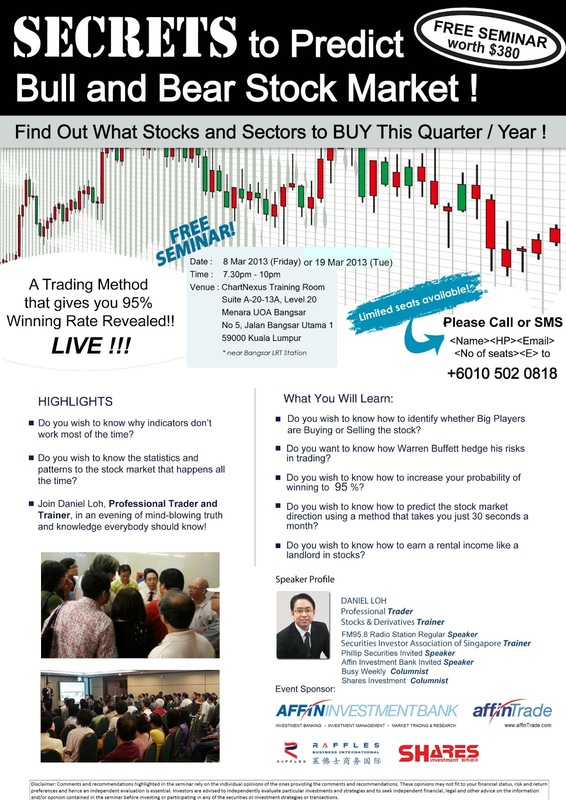 All these SECRETS will be found in our INVESTMENT SEMINAR in Bangsar, Malaysia!! We will also be touching on how you should prepare yourselves after election and for this year also. 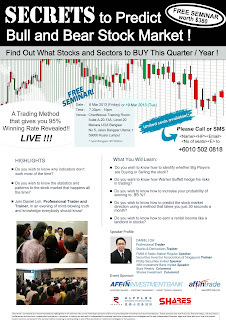 Be sure to join us for an investment seminar next TUESDAY, 19th March 2013, 7.30pm - 10pm! 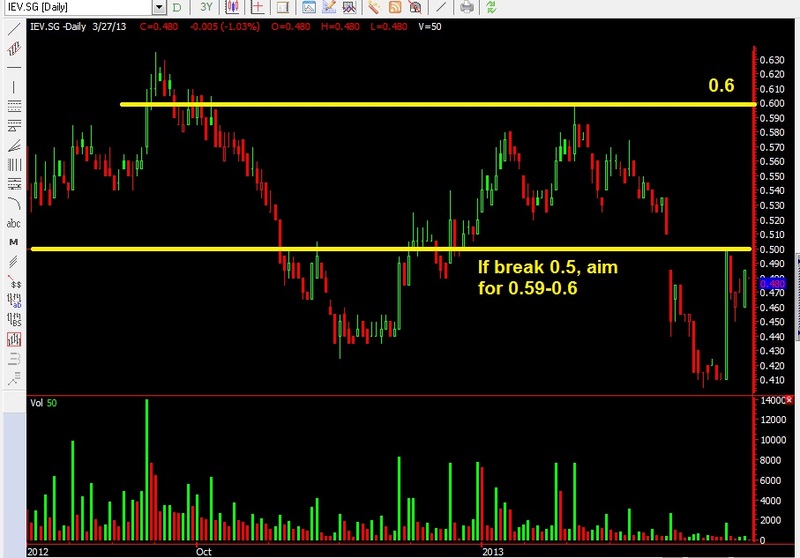 On the 2nd Jan, we issued a stock tip on a malaysian counter PWROOT. Btw in the last article, we did mention sell Zhulian at $2.99 to change to this stock. $2.99 is Zhulain highest! Now Zhulian is at $2.78. You would have save money on Zhulian and make money in PWROOT. Not only has PWROOT gone to target 2, it is $1.53 now, and still looking strong. 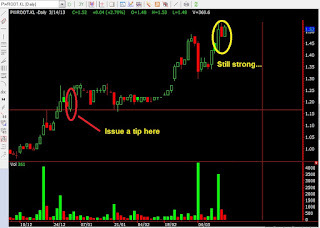 Now I set a new target $1.59-$1.60 with a stop loss of $1.47. Let us see how it progress. 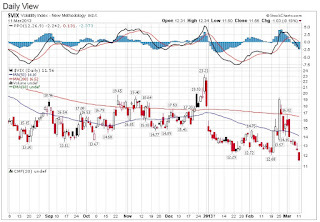 We have entered into a phase where VIX is kept below the $20 mark, a place that signifies low volatility. Is it a good thing or bad thing? I hope it is not calmness before the storm. 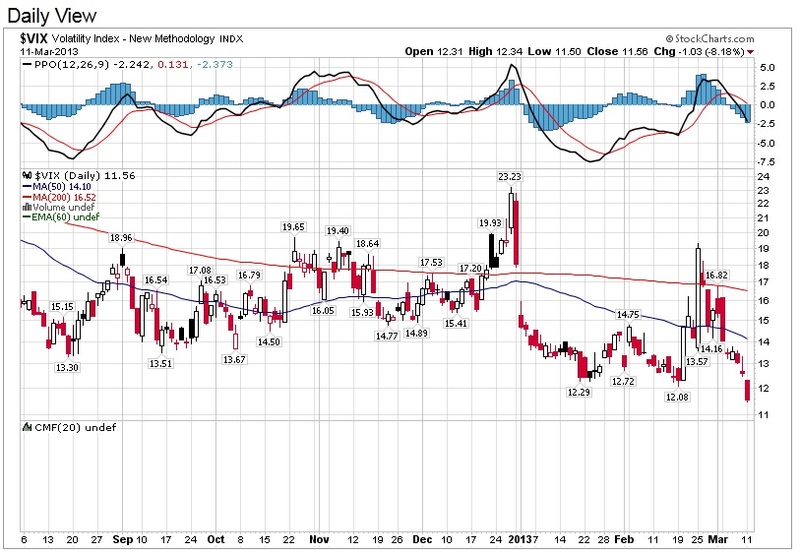 VIX one day will burst forward when panic grabs the market. We got a slight taste 2 weeks before when it shot up more than 30% 2 times in 4 days. At the moment, let us enjoy the bull run in US. But also keep in mind that once VIX consistently rises, it may be time to leave the market. Yesterday we saw Dow continues its movement up when it released a ADP employment report that is above expectations. It rises by 40 points. STI also rises yesterday with the hype of breaking new high by the DOW and soared 40 points, marking the best one day gain this year. ADP employment report is a private report on the jobs status of America, seen as a precursor to the non farm payroll. Of course, it has an accuracy of being right 60% of the time in predicting the results of non farm payroll. For now, the opinion is tilted to a better than expected results for Friday Non farm. Optimistic news and that is the reason of Dow increase last night. But having said that, taking a look at Singapore market, I did not see flourishness in a lot of stocks. It seems still dull to me as the stocks did not recover to its peak. Some barely turned. Some dropped back today. Hence, I would still suggest not to place your bets first. I sense some sluggishness in local market. Will Non farm payroll on Friday revive the local stocks? not sure, we just have to wait and see. or click on picture and right click to view image. A friend asked me why I am so quiet about my blog. Seems like I did not give many tips recently. Ha, as I have mentioned, I am not very confident about the market yet. Hence I am lying low now before the BIG Jobs report on Friday. We can attribute the bullishness of US market to the good ISM reports in both manufaturing and non-manufacturing sectors. However I do not want to add any bullish positions before the employment reports. There will be a few reports coming out to give the glimpse of the US job market. Tonight we have ADP employment report, tomorrow we have jobless claims, and on Friday we have the all important non farm payroll and unemployment rate report. So JOBS JOBS JOBS! I do not want to predict yet if Friday will be good before the jobless claims on Thursday. Both ISM results propel US to BREAK all time high! A double whammy in ISM manufaturing and ISM non-manufacturing results propel the DOW to break a all time 2007 high point of 14198. Now it is near 14,276. What an achievement! It brushed it off today with a 140 points gain now. All time high! This is a significant milestone. All time high normally signals economy is getting better as companies are doing better and are reflected by the strong stock prices. In General, this milestone reflects stocks are at their most expensive time. Without the strong earnings and better economy, it normally don't happen. 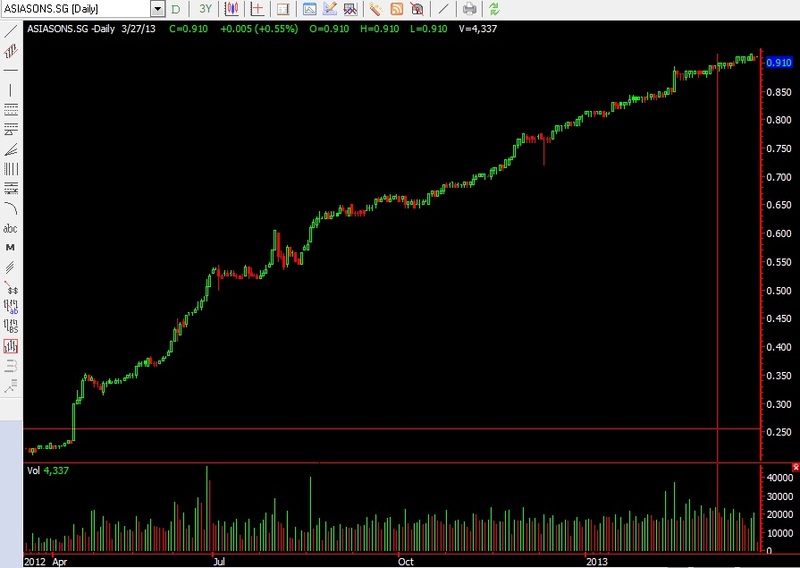 Asia Leading Investment Guru Mr Hu Li Yang once says that this bull run still has 2-3 years more. He say it last year when we are still screaming about exiting the market talking about the Euo falling apart. It proves he is right! This bull run indeed carries the US to historical height now. How many years more? According to Mr Hu, about 2 years more. But it won't be a smooth ride forward! There will still be ups and downs. Although the long term bull run still will continue. But bear in mind that short term wise, he did mention that DOW has a strong resistance of 13600-14300. Let us see if Dow indeed carry on the run. Let us see if there is a rubberband effect to pull it back and when it happens. In the meantime, let Wallstreet rejoice and celebrate. Just take note that it wont last forever. Short term, there will be a correction. The question is "Will it be this month???" Radio FM958 (Fri, 1 Mar 1.15pm) talking about Market Outlook for March, is there a possibility of reversal? Now is 3am in the morning. Yes it does seem like US is enjoying the prospect of Dow beating all time high target. It sure garner some limelights today. CNBC has been talking about it. As the media is focusing their attention on this prospect, we maintain our view that this is a high point to be in. Oh mind, this is the all time high, not just the 5 years high point we are talking about. If it breaks, it sure is a great feat amid the europe problems and high unemployment rate and the debt ceiling. However short term wise, we still maintain our view that this is a risky state to be in. "Take note of March and April" it seems we have been giving this view umpteen times. We still maintain this view. 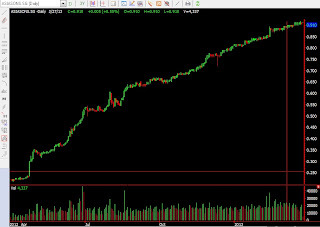 As the whole world still rejoins in this festive mood of the market, we think that for the next 2 months, this 14198 point acts as a rubber band. If it really breaks, the more it goes up, the more it will pull back. The best way to have is a slow upward movement slowly past the 14198 so that this music can still go on a longer time. You do not want to be caught in a situation where the rubberband pulls back hard. As the market rejoins, we do not want to dampen this spirit.